Gulliver's Travels is a 1939 American cel-animated Technicolor feature film, directed by Dave Fleischer and produced by Max Fleischer for Fleischer Studios about an explorer who helps a small kingdom who declared war after an argument over a wedding song. 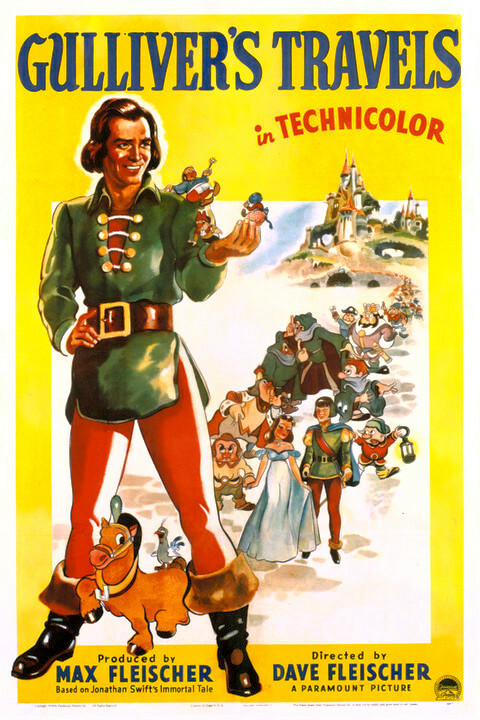 The film was released on December 22, 1939 by Paramount Pictures, who had the feature produced as an answer to the success of Walt Disney's box-office hit Snow White and the Seven Dwarfs. The sequences for the film were directed by Seymour Kneitel, Willard Bowsky, Tom Palmer, Grim Natwick, William Henning, Roland Crandall, Thomas Johnson, Robert Leffingwell, Frank Kelling, Winfield Hoskins, and Orestes Calpini. This is Paramount's first feature-length animated film. Gulliver was the second cel-animated feature film ever released, and the first produced by an American studio other than Walt Disney Productions. The story is based very loosely upon the Lilliputian adventures of Gulliver depicted in Jonathan Swift's 18th century novel Gulliver's Travels.